«Put on the whole armor of God.» (Ephesians 6:11). 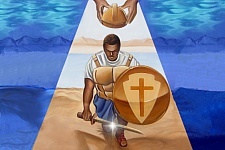 «Quest for God’s Armor» is an exciting game that challenges 1 to 4 players to assemble the six parts of the Armor of God. But be prepared for spiritual battles along the way! The category «Basic Trivia» is included in this free downloadable version. Additional question modules can be easily ordered to expand the question database. Seek the fruit of the Spirit and the virtues of Christian life, while avoiding stumbling blocks and quenching the enemy’s flaming arrows, to succeed in your quest. When you are in trouble, a guardian angel will come to your assistance. But use this heavenly help wisely throughout the game! The first player to put on the full armor of God wins. Using different options (categories of questions, number of guardian angels, number of layers in each piece of armor), the difficulty level can be set for each player, so kids, parents, and grandparents can all play together! The Bible version used in «Quest for God’s Armor» is the American King James Version. Microsoft Windows® XP or later. You will download the file Armor-RegularVersion.zip. It is a compressed ZIP file. Double-click on this file to open it, then drag all the content to a directory of your choice. Then simply double-click on the file ArmorRegul.exe to start the game «Quest for God’s Armor». A Deluxe version of this game is available. A French version of this game is available.